The first step in dealing with all ant problems is identification. If possible, it’s always best to have a sample available for us to inspect so we can quickly determine the species and put an effective treatment plan in place. We have a range of treatments available for different situations within the home or workplace and for different ant varieties. The professional products we use will destroy most ant colonies rapidly. They are also far more effective than off the shelf products purchased from the local supermarket or DIY store. Safety of children and pets is a key requirement of many of our clients and we always ensure that the treatment plans we employ keep this in mind. There are over 11,000 known ant species around the world. Most, however, prefer sunny warm climates so the UK is only home to around 50 varieties. Of those, six are fairly common and widely found throughout the country. Most people will be familiar with the common black ant due to their tendency to enter houses looking for food. They also frequently create nests in patios, garden borders, on lawns and seemingly anywhere else they may find a small gap. Colonies can reach up to 15,000 individuals and their fondness for sugary substances often leads them into contact with humans. Often mistaken for red ants as they have an orange tinge to their colouring. They are generally found in fields and meadows (hence the name) where they construct large mounds as nests. They pose no danger to humans and are in fact rarely seen by us as they spend the majority of the time underground. The Red Wood Ant is another common UK variety. Like the yellow meadow ant, they tend to build their nests away from humans in woods and forests. This species is aggressive and will bite and spray acid if disturbed. There are a number of subspecies within this group but all are red in colour, have a nasty sting and are aggressive in nature. The name of this species comes from the USA where they are commonly found nesting between paving slabs on pavements. A cousin of the red wood ant they also have a nasty bite and will become aggressive if disturbed. They tend to be found in the Midlands and southern England. The dramatic sounding name is down to the fact they raid other ant species nests killing the queens and taking control of the worker ants. They are the largest of all the UK ant species and spray formic acid as a defence if under threat. Ant Infestations – What Can You Do? The most common ant species that the majority of people will encounter is the black ant or garden ant. They are harmless to humans and don’t carry disease but can certainly be an unwanted nuisance. 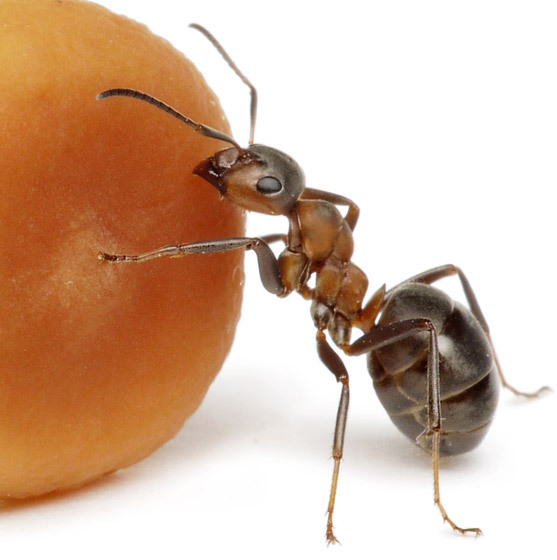 Ants travel large distances to discover food. Once one of their number has found something interesting they will send a message to other colony members. Before long large numbers will be clustering around the food source. If this happens to be in your kitchen cupboard this can be a very unpleasant experience. Keep kitchen work surfaces clean and free from anything sweet or sticky. Common black ants are drawn to sweet foodstuffs so removing sugary residue will help deter them. If the ants have found a way into your home and you can trace where they are coming from then simply blocking the whole may be the solution. If you have pets or young children we don’t recommend using any off the shelf sprays, powders or gels as they can be very dangerous to those with little fingers or furry paws. Store your food in airtight containers and ideally keep them in fridges or high cupboards. Kitchen floors are very often a great food source for ants. Only a few stray crumbs can be a nice ant-sized meal and so regular vacuuming and sweeping, especially under appliances and cupboards is advisable. If you have a pet that eats from a bowl on the floor make sure any food residue is cleared up when they’re finished. Both indoors and outdoors make sure bins are properly sealed. Ants will quickly descend on any leftovers they find and certainly don’t mind eating what you’ve thrown out. If the above fails or you don’t wish to tackle the ant infestation yourself then you should call an ant control expert. If you think that you have a problem with ants then get in touch with us for a free, no obligation quote.